Acronis, the leader in IT backup solutions, offers an easy-to-use and lightning fast backup solution for Office 365. Office 365 mailboxes and individual emails, contacts, calendars and tasks can be easily backed up and restored. Mailboxes can be backed up to cloud or on-premise storage, with the choice of four encryption standards for optimal security. 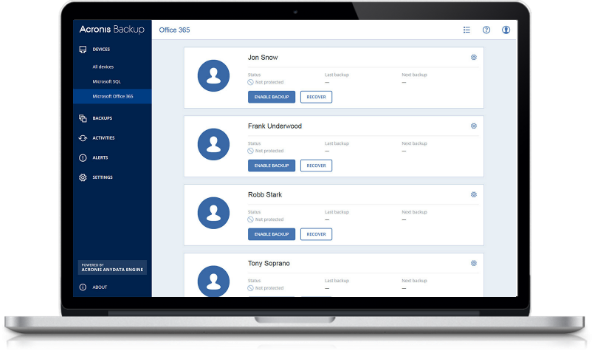 Acronis Office 365 Email Backup is an add-on to Microsoft Office 365 for Business, offering your customers protection and security against data loss. Offer your customers an easy-to-use backup solution with granular recovery and secure encryption as an attractive add-on to Office 365. A web-based console centralizes backup management and is accessible from any device. Easily choose exactly which Office 365 mailboxes or individual emails, calendar, tasks and contacts you want to restore. Search for and preview emails based on subject, sender, recipient or date range to be sure they are exactly what you need to recover. Offer your customers powerful email backup alongside Office 365 with no extra hassle. Choose one of four encryption standards for in-flight and at-rest encryption and password protection. Combine with an Acronis Cloud Storage subscription to store secure, offsite backups in the Acronis cloud.